Gears are used in a variety of applications, such as clocks, industrial machinery, music boxes, bicycles, and automobiles. A gearbox is a major source of vibration and noise irrespective of how it is used. The most effective approach to reduce the noise radiation from a gearbox is to perform a vibroacoustic analysis to improve the design. Let’s see how the COMSOL Multiphysics® software can be used to help build quieter transmission systems. The noise generated due to gear meshing can be classified into two types: gear whine and gear rattle. Gear whine is one of the most common types of noise in a gearbox, especially when it runs under a loaded condition. Gear whine is caused by the vibration generated in a gear because of the presence of transmission error in the meshing as well as the varying mesh stiffness. This type of noise occurs at the meshing frequency and typically ranges from 50 to 90 dB SPL when measured at a distance of 1 m.
Gear rattle is observed mostly when a gearbox is running under an unloaded condition. Typical examples are diesel engine vehicles such as buses and trucks at idle speed. A gear rattle is an impact-induced noise caused by the unloaded gear pairs of the gearbox. Backlash, required for lubrication purposes, is one of the gear parameters that directly impact the gear rattle noise. If possible, simply adjusting the amount of backlash can reduce gear rattle. We know that transmission error is the main cause of gear whine, but what exactly is it? When two rigid gears have a perfect involute profile, the rotation of the output gear is a function of the input rotation and the gear ratio. 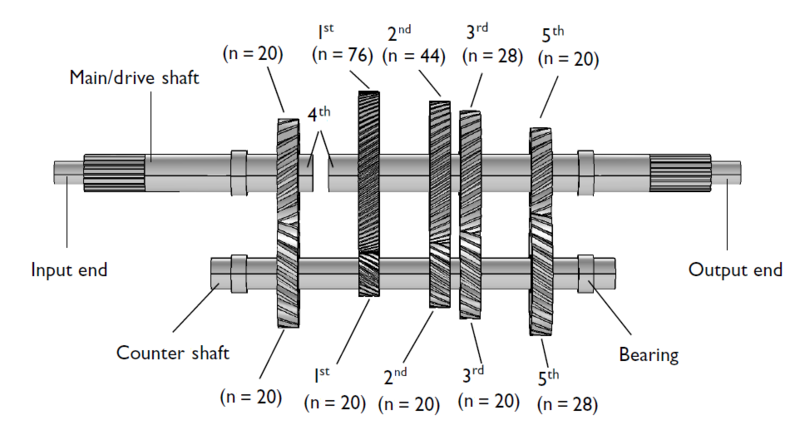 A constant rotation of the input shaft results in a constant rotation of the output shaft. There can be various unintended and intended reasons for modifying the gear tooth profile, such as gear runouts, misalignment, tooth tip, and root relief. These geometrical errors or modifications can introduce an error in the rotation of the output gear, known as the transmission error (TE). Under dynamic loading, the gear tooth deflection also adds to the transmission error. The combined error is known as the dynamic transmission error (DTE). Reducing gear whine or rattle to an acceptable level is a big challenge, especially for modern complex gearboxes, which consist of many gears meshing simultaneously. 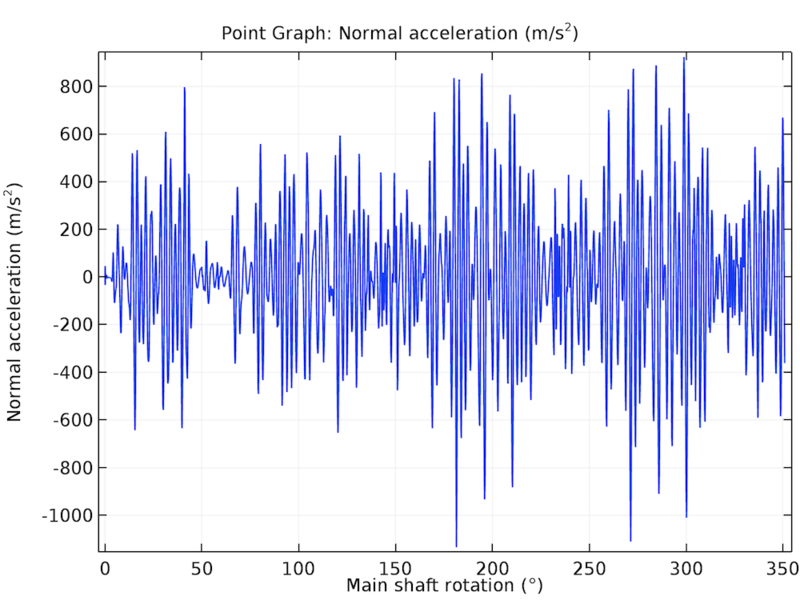 By accurately simulating these complex behaviors, we can design a quieter gearbox. 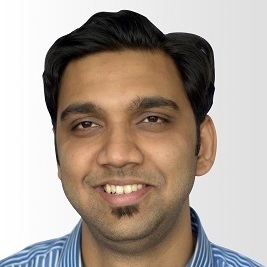 COMSOL Multiphysics gives designers the ability to accurately identify problems and propose realistic solutions within the allowable design constraints. With such a tool, we can optimize existing designs to reduce noise problems and gain insight into new designs earlier in the process, well before the production stage. A gearbox model in the COMSOL Desktop®. Let’s consider a five-speed synchromesh gearbox of a manual-transmission vehicle in order to study the vibration and radiation of gear whine noise to the surrounding area. The gearbox is in a car and used to transfer power from the engine to the wheels. Geometry of a five-speed synchromesh gearbox of a manual transmission vehicle. 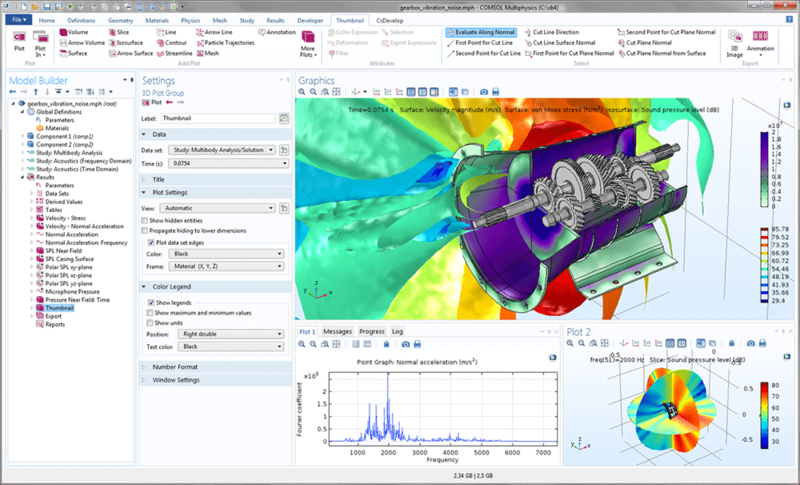 In the multibody analysis, we compute the dynamics of the gears and housing vibrations, performed at the specified engine speed and output torque in the time domain. For the acoustic analysis, we compute the sound pressure levels outside the gearbox for a range of frequencies using the normal acceleration of the housing as a source of noise. First, we look into the gear arrangement in the synchromesh gearbox. Here, helical gears are used to transfer the power from the input end of the drive shaft to the counter shaft and further from the counter shaft to the output end of the drive shaft. 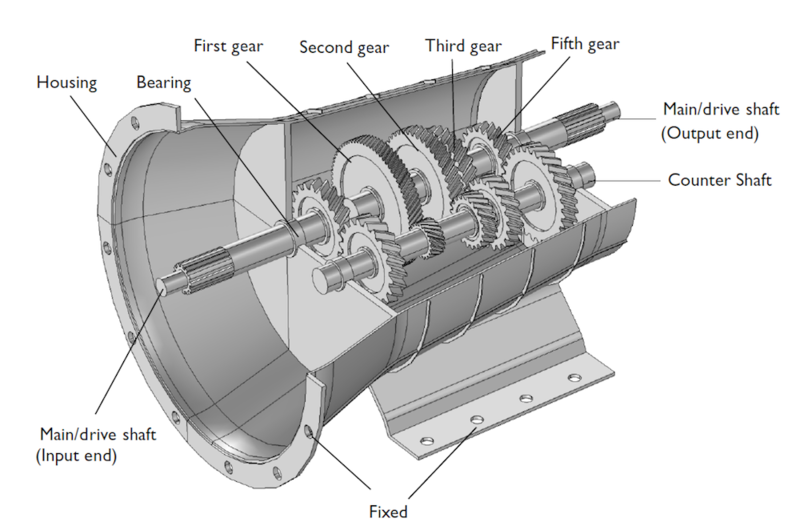 The gear arrangement in the five-speed synchromesh gearbox, excluding the synchronizing rings that connect the gears with the main shaft. All of the gears on the counter shaft are fixed to the shaft, whereas the gears on the drive shaft can rotate freely. Only one gear at a time is fixed on the shaft. In real life, this is achieved with the help of synchronizing rings. In the model, hinge joints with an activation condition are used to conditionally engage or disengage gears with the drive shaft. The von Mises stress distribution in the housing together with the speed of different gears. In order to have a better understanding of the variation of normal acceleration as a function of time, we can choose any point on the gearbox housing. The time history of the normal acceleration at that point is shown below. Let’s transform this result to the frequency domain using the FFT solver. In this way, we can find the frequency content of the vibration. It is clear from the frequency response plot that the normal acceleration of the housing contains more than one dominant frequency. The frequency band in which the housing vibration is dominant is 1000–3000 Hz. 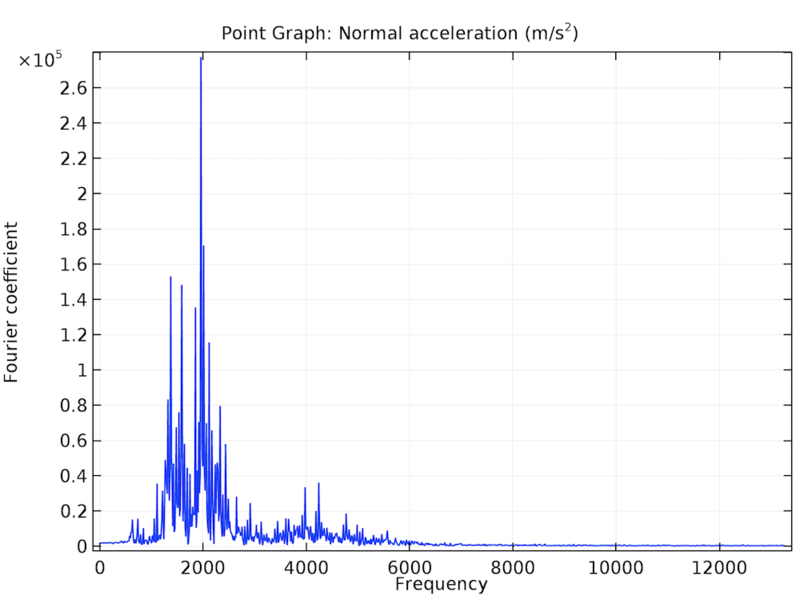 Time history and frequency spectrum of the normal acceleration at one of the points on the gearbox housing. 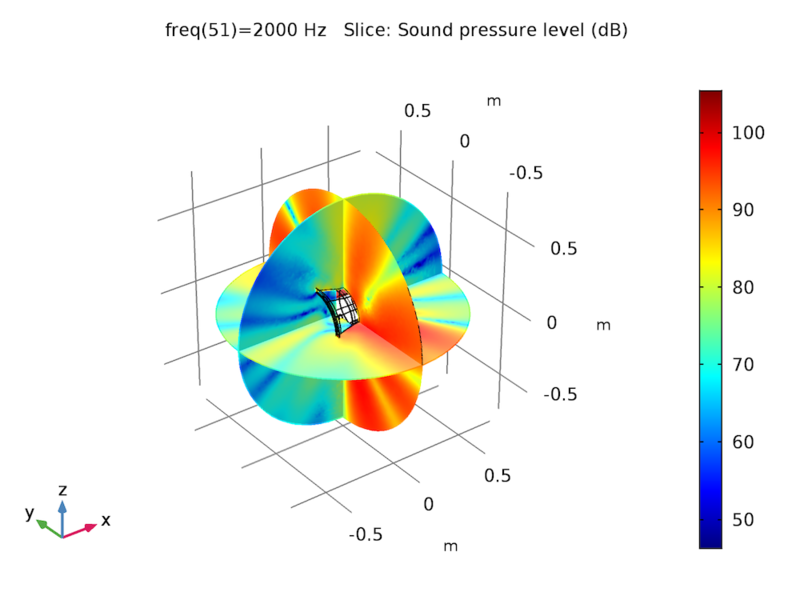 Once we have simulated the vibrations in a gearbox, let’s see how to model the noise radiation in COMSOL Multiphysics. To begin, we create an air domain outside the gearbox to simulate the noise radiation in the surrounding. In order to couple multibody dynamics and acoustics, we assume a one-way coupling, as the exterior fluid is air. This implies that the vibrations from the gearbox housing affect the surrounding fluid, whereas the feedback from the acoustic waves to the structure is neglected. It is a good assumption that the problem is one-way coupled. The acoustic analysis is performed for a range of frequencies. As the multibody analysis is solved in the time domain, the FFT solver is used to convert the housing accelerations from the time domain to the frequency domain. The air domain enclosing the gearbox for acoustic analysis. 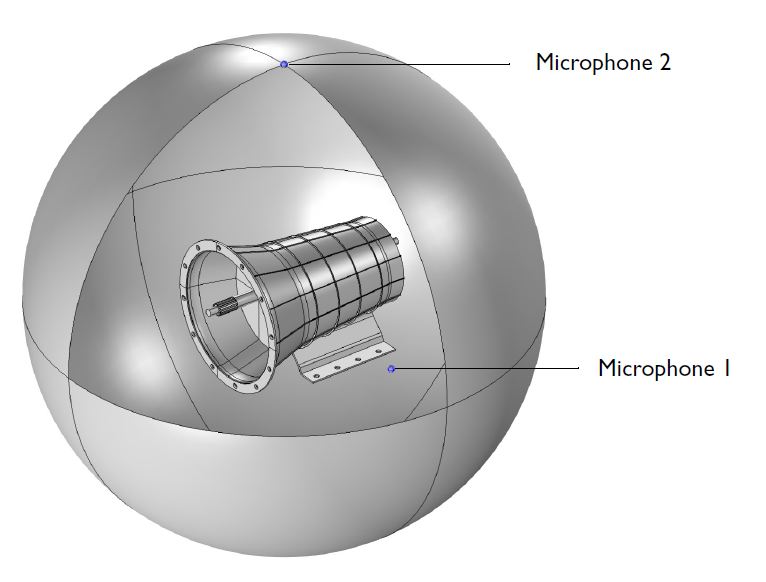 The two microphones placed to measure noise levels are shown. As a source of noise, the normal acceleration of the gearbox housing is applied on the interior boundaries of the acoustics domain. In order to avoid any reflections from the exterior boundaries of the surrounding domain, we apply a spherical wave radiation condition. With these settings, we can solve for the acoustic analysis and look at the sound pressure level in the near field as well as on the surface of the gearbox housing at different frequencies. For a better understanding of the directivity of the noise radiation, we can create far-field plots in different planes at different frequencies. The sound pressure level in the near field (left) and at the surface of the gearbox (right). 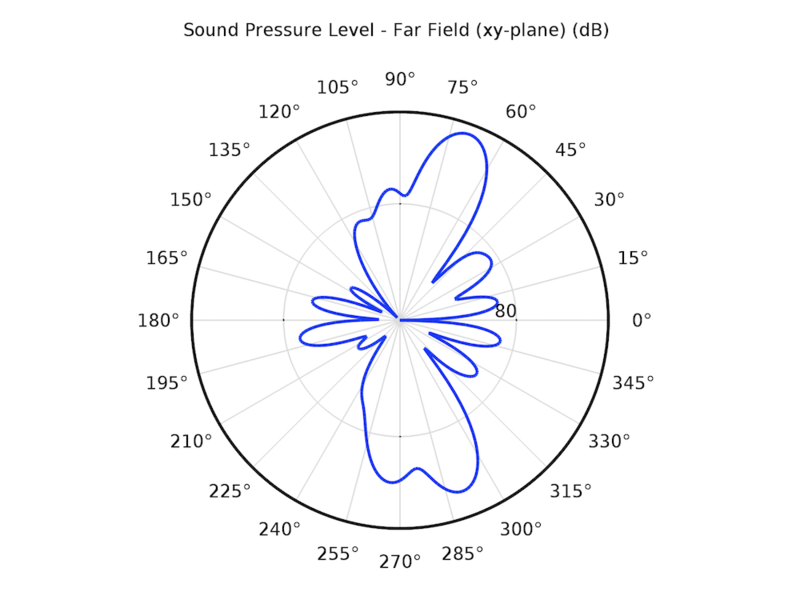 The far-field sound pressure level at a distance of 1 m in the xy-plane (left) and xz-plane (right). 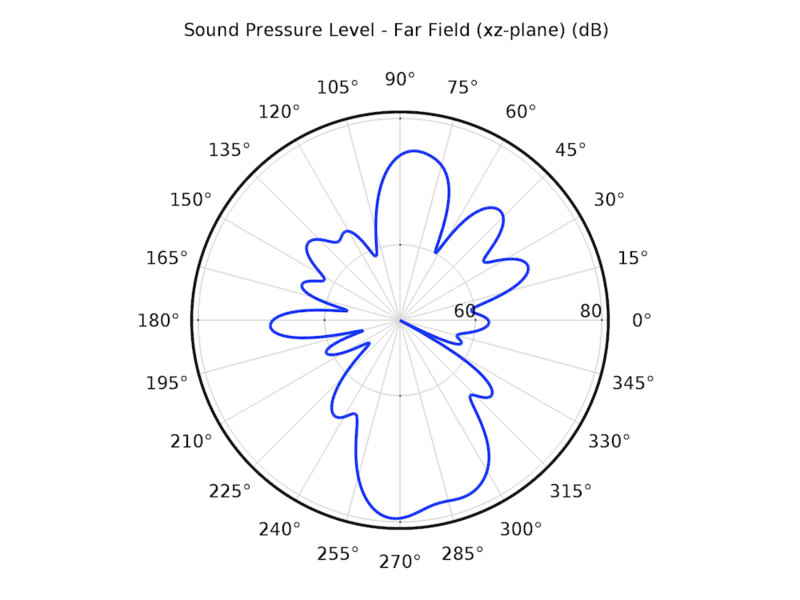 After visualizing the sound pressure level in the outside field, it is interesting to find out the variation of sound pressure with frequency at a particular location. For this purpose, two microphones are placed in specific locations. These microphone locations are defined in the Parameters node in the results and can be changed without updating the solution every time. 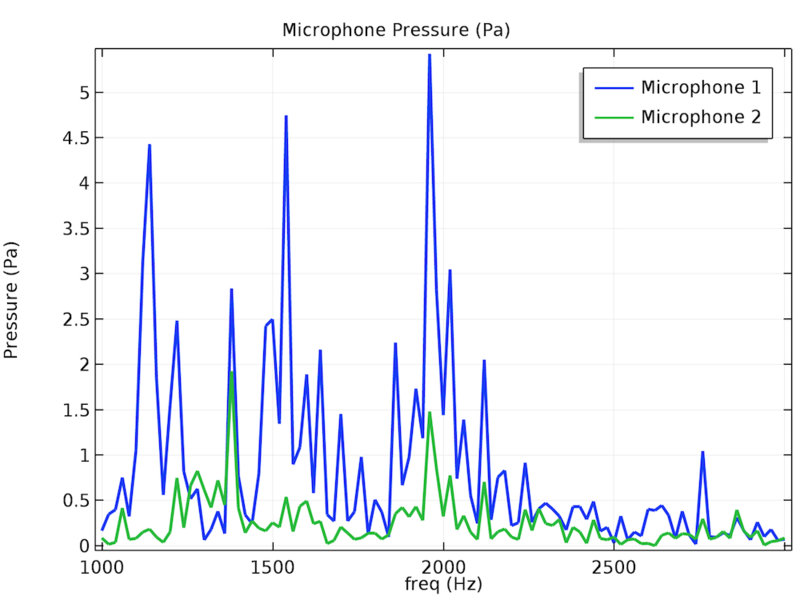 The frequency spectrum of the pressure magnitude at the two microphone locations. The pressure response plot at the microphone locations gives a good idea of the frequency content present in the noise. However, wouldn’t it be nice if we could actually listen to the noise recorded at the microphone, just like in a physical experiment? This is possible by writing Java® code in a method using the magnitude and phase information of the pressure as a function of frequency. We have already looked at the acoustics results for various frequencies. It would also be nice to see them in the time domain. Let’s transform the results from the frequency domain to the time domain using the FFT solver so that we can visualize the transient wave propagation in the surrounding area of the gearbox. Animation showing the transient acoustic pressure wave propagation in the surrounding area of the gearbox. 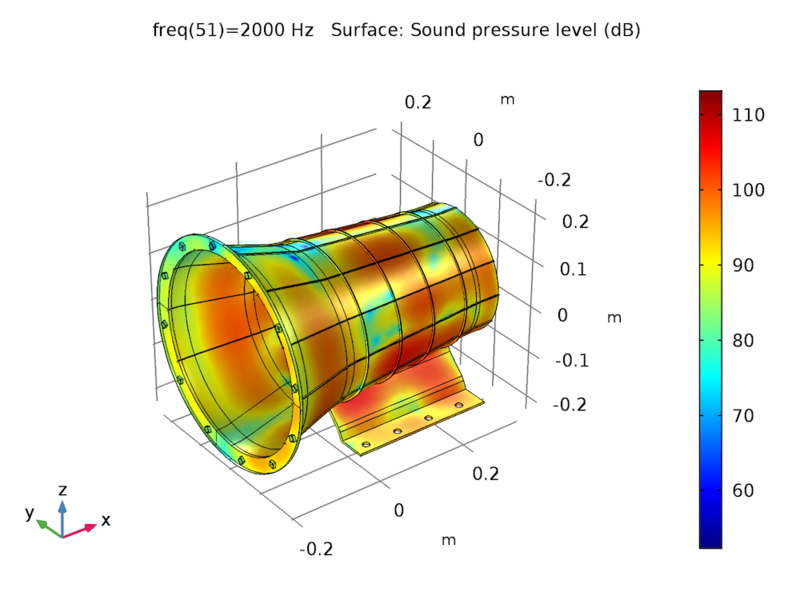 The above approach describes a technique to couple multibody analysis and acoustics simulation in order to accurately compute the noise radiation from a gearbox. This technique can be used early in the design process to improve the gearbox in such a way that the noise radiation is minimal in the range of operating speeds of the gearbox. Additionally, methods — new functionality as of version 5.3 of the COMSOL Multiphysics® software — enable us to actually hear the noise generated by the gearbox — making the simulation one step closer to a physical experiment.